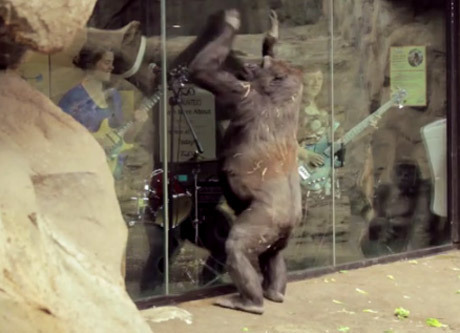 San Francisco indie rock trio Grass Widow recently made a stop at Boston's Franklin Park Zoo, where they performed their intricate song "Milo Minute" for a group of gorillas as part of the Music For Animals project. Individual animals have tastes, just like we do. There is likely no "music for dogs" just as there is no "music for humans." There are things we can hear and certain decibel levels that hurt our ears–but beyond that, species level music doesn't make a whole lot of sense. I also got curious about what it would be like to play shows for animals who are normally shows themselves. What might we learn about them as individuals? What might we learn about us? Nothing exposes the limits of the human imagination more than imagining what it is like to be someone else. Particularly if that someone else is nonhuman. Check out the adorable, endlessly fascinating performance below courtesy of The FADER. Grass Widow "Milo Minute" from what rabbit on Vimeo.